Maintaining your beautiful smile, sometimes referred to as preventive dentistry, is the ultimate goal of Premier Dental. Preventing dental problems before they occur can help you avoid unnecessary dental treatment and destruction of healthy teeth. The two main preventive dentistry causes of tooth loss are decay and gum disease. The better you deal with these two problems, the more chance you will have of keeping your teeth for life. When our team at Premier Dental and patients work together, we can help you prevent the need for expensive treatment. Especially root canals, crowns and extractions. We offer dental exams, cleanings, oral cancer screenings, high-technology/low-radiation x-rays. We may recommend fluoride or sealants to keep your teeth strong and healthy. Our new, conveniently located office in Lee’s Summit,MO was designed to keep our patient’s dental health and comfort in mind. Every six months, we recommend a routine dental exam with Dr. Caye to reduce the chance of developing serious oral health problems. When you arrive, we will begin with a dental exam, which is the foundation of any preventive dentistry maintenance program. Our team at Premier Dental will screen for periodontal disease, oral cancer, cracks in the teeth, tooth decay. We also check old dental work that needs to be replaced. We also use the latest in digital x-ray technology to detect early stages of tooth decay while limiting radiation exposure. This will help us detect any developing problems before they become larger issues. We use this information along with intraoral photos to inform and show you about the overall condition of your mouth. After the exam, our experienced and friendly dental hygienist will provide a customized dental cleaning. The cleaning offers more in-depth treatment than at-home brushing and flossing alone can provide. Our cleanings are designed to help prevent plaque buildup, tooth decay, gum disease. It also, prevents other serious risks that could potentially develop without regular care. A majority of people need a dental cleaning twice a year. While others who build up heavy stain and tartar or are battling dreaded gum disease may need to have a teeth cleaned more frequently. After your dental exam and cleaning, we will explain any dental concerns and offer tips on how to improve hygiene. It is our goal to help you understand the condition of your oral health. We promise to explain things in common terminology that is simple and understandable. We like to think of ourselves as your dental coach. Good coaches don’t lecture and scold you. They take the time to learn what your personal needs are and how to help you become healthier. Some people need instructions on how to brush their teeth including how long to brush or how to floss. Maybe it’s a particular area that is just hard to reach and is being missed, or an out of position tooth that is tricky to get clean. We even have a few tricks up our sleeves for special circumstances. It is our calling to coach you, cheer you on, and encourage you to take great care of your teeth. We care and want you to succeed; your teeth are priceless and we want them to last a lifetime! One of the most powerful diagnostic tools we use in preventive dentistry is digital x-ray and panoramic technology. Our digital x-ray system quickly produces clear images which allow for accurate detection of a wide range of dental concerns. Digital x-rays are typically taken yearly or as needed and expose patients to much less radiation. It offers greater speed, comfort, safety, and efficiency than traditional methods that use film. 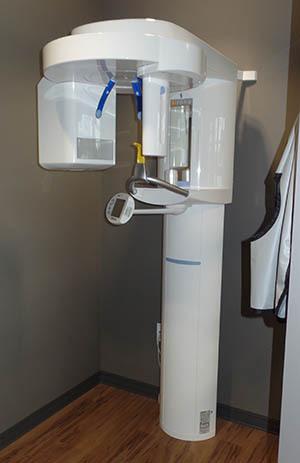 Our brand new panoramic x-ray machine allows us to see a clear picture of all of the teeth. Including wisdom teeth, the TMJ, and any cancerous lesions that may be hidden below the gum tissue. Also, digital X-rays are a greener option, as the images will be sent to the computer monitor. They do not require development in harmful chemicals that can damage the environment. Preventive dentistry includes screening for oral cancer and is an important part of every routine dental exam. Diagnosing oral cancer in its very early stages is critical, and can lead to a more successful treatment outcome. There are no early symptoms that are obvious; therefore, oral screenings during your routine dental checkups are the most effective and quickest way to recognize any irregularities. These screenings are quick and painless, as Dr. Caye uses the latest diagnostic tools available to spot any areas of soft tissue that could possibly be cancerous. For patients who do not smoke or use tobacco, we suggest having an oral cancer screening once every year. For those patients who do smoke or use tobacco, we recommend two screenings per year. With early diagnosis and treatment of oral cancer, studies have indicated the chances of survival to be approximately 80 to 90 percent. Maintenance, such as fluoride treatments and sealants, may be suggested during the cleaning. They strengthen teeth and provide additional protection from decay. For years, dentists have been providing early prevention for cavities by applying fluoride and sealants to teeth. Fluoride helps prevent cavities through remineralizing enamel. Acid from bacteria and certain foods and drinks strip away minerals from our teeth causing them to become soft and less resistant to cavities. Fluoride helps to replenish these minerals and make our teeth strong again. It is found in our drinking water and our toothpastes. However, extra strength fluoride gel and/or toothpaste may be recommended to patients suffering from excessive acid breakdown. Dental Sealants are thin resin coatings that are applied to the deep cracks and canyons (pits). They are common on the biting surfaces of back teeth. Deep grooves can be a hiding spot for bacteria that a toothbrush bristle cannot thoroughly clean. The main benefit of sealants is that they block out bacteria from settling into these deep groves. They also aid in the cleaning process. Sealants are typically recommended for back teeth that have just erupted into the mouth but can be beneficial no matter the age of the patient. With fluoride protecting the walls and sealants coating the tops, the team at Premier Dental has you covered before any issues develop. If you’re playing any kind of sports, you need to protect your teeth. Injuries to the mouth and teeth during physical activity and playing sports are easily prevented with a custom-made mouth guard. Over-the-counter mouth guards are not made specifically for your mouth and can become a choking hazard and block your air intake. With a custom-fitted mouth guard, you will breathe easier and more comfortably knowing that your smile is protected. An accidental punch, tackle, or kick in the mouth can damage your teeth. Basketball and football are top offenders. A mouth guard is an essential piece of athletic gear that should be part of your standard equipment from an early age. Studies show that athletes are 60 times more likely to suffer teeth injury’s if they’re not wearing a guard. They can be made in a variety of thicknesses and team colors to make any athlete happy. Broken teeth and injuries to your lips, face, jaw or tongue can be minimized. Mouth guards help cushion an injury to the face since they are typically covering the upper teeth. If you wear braces or another fixed dental appliance on your lower jaw, your dentist may suggest a mouth protector for these teeth as well. Research shows that oral appliance therapy, or night guard, is an effective treatment option for sleep apnea, snoring, and TMJ disorders including grinding and clenching. The mouth guard is worn only while you sleep and fits like an orthodontic retainer. These oral appliances support your jaw and are the first and least invasive step in treating TMJ disorders. Another area of preventive dentistry is jaw clenching and night-time grinding. They are becoming a big problem for many stressed out adults. Clenching can place enormous amounts of destructive force and friction on the teeth, gums, and jaw. Signs include worn, cracked or broken teeth, flattening of the front teeth, craters on the tops of teeth, or notches in the sides of teeth, tired jaw muscles, and frequent tension headaches. For patients experiencing these symptoms, Dr. Caye can create a custom night guard that stabilizes the bite and prevents clenching and grinding from occurring. Night guards are designed to have a layer of cushion on the inside for comfort and a layer of hard plastic to make them durable. Patients who have grinded through over-the-counter guards will enjoy the near indestructible design of our night guards. Sleep apnea can have dramatic effects on your overall health. A common cause of sleep apnea and snoring is the blockage of the upper airway. This is caused by the jaw muscles relaxing in our sleep which allows the lower jaw and tongue to fall back and collapse the airway. Our sleep apnea appliance is custom designed to gently hold the lower jaw forward. It also keeps the airway open giving you and your partner a good night’s rest. Gum disease affects millions of Americans, many of whom may not even be aware they have it. Without proper cleanings and regular flossing, plaque and tartar buildup can allow bacteria and disease to flourish in our mouths. Unhealthy gums are a red flag; they can be a warning sign of future tooth loss and the potential for stroke and heart disease. At Premier Dental, our goal to eliminate the potential for gingivitis and gum disease with customized oral hygiene treatment plans. That include non-surgical techniques designed to remove pockets of bacteria and disinfect the gums. Preventive dentistry may include deep cleaning (scaling and root planing) and the application of antibiotics to eliminate disease. This treatment will also provide a risk assessment, gum pocket measurement, and thorough gum tissue examination. If risks are detected the appropriate treatment to get your periodontal health back on track will be recommended and explained. We have flexible appointment times available and treat emergencies at Premier Dental. Please call us today to schedule an appointment.